Paw Print Genetics - Are There Risks for Genetic Disease with Cross-breeding? Some people will say that there is little or no risk for genetic disease in crossbreeding and no need for genetic testing by virtue of the fact that the dogs are crossbred. I use Progressive Retinal Atrophy as an example to illustrate the potential genetic consequences of such breeding, but the premise and the potential risk for disease holds true for any possible genetic condition that affects dogs. Progressive Retinal Atrophy (PRA) is an inherited progressive eye disease that affects the part of the eye called the retina. Light striking special cells of the retina (primarily photoreceptor cells called rods and cones) leads to the creation of the picture that is seen by the brain. The retina is often compared to the film of a camera. PRAs can progress from vision impairment, to night blindness or to hesitancy in certain situations and lead ultimately to total blindness. Total blindness in a PRA affected dog may not be recognized until they are taken to an unfamiliar environment while other dogs may be recognized far earlier due to dilated pupils, an attempt by the eye to let in more light, and eye shine that occurs when the retina reflects back light. PRA is genetic but rather than being one condition; PRA is technically a group of conditions with different genetic causes that have the same ultimate outcome, degeneration of the retina leading to visual impairment or blindness. The age of onset and rate of progression of PRA varies between the different types of PRA and between individual dogs. Most forms of PRA are inherited in an autosomal recessive pattern except for PRA in Mastiffs and Bullmastiffs, which is inherited in an autosomal dominant pattern. X-linked recessive PRA is found in Siberian Huskies and Samoyeds and a different form of X-linked PRA has been described in Border Collies. Genetic testing is available for many of these forms of PRA. The different genetic causes and modes of inheritance of PRA means that two dogs of different breeds that are at risk for PRA may or may not produce affected puppies. Many people will say that cross breeds do not have significant risk for genetic disease, but this is really not true. Dogs of different breeds affected with different forms of autosomal recessive PRA may produce no affected puppies and have no risk to produce PRA affected puppies, but dogs of different breeds that are carriers of the same form of PRA (same mutation in a common gene) can and will produce PRA affected puppies just as if they were dogs of the same breed. For instance, if a Beagle who is a carrier of PRA is bred to a Cardigan Welsh Corgi that is a carrier of PRA, the chances are that NO affected puppies will be produced, because the mutations responsible for PRA is these breeds are in entirely different genes. On the other hand, breed that same Beagle to French Bulldog or a miniature long-haired Dachshund that are carriers of the same PRA mutation then these cross bred puppies will have a 25% risk to be affected with PRA, just as if they were dogs of the same breed. 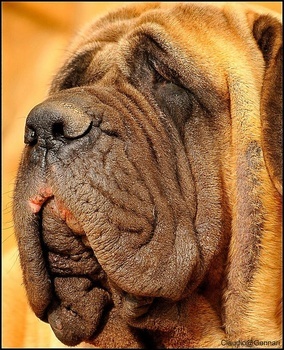 Mastiffs and Bullmastiffs with the PRA-D gene (Autosomal Dominant PRA in those breeds) will have the potential to produce affected puppies no matter what breed of dog they are bred to because this is a dominant trait and the puppies will have a 50% chance of inheriting the mutation and being affected. With a dominant condition, only one copy of the gene can produce the disease, so it does not matter how much cross-breeding is done, affected puppies will potentially be produced in each generation. Genetic testing of the specific mutations and then selecting unaffected, non-mutation carrier dogs, is the only way to fully avoid this disease in the offspring. Screening parents for PRA can be done by a trained ophthalmologist, but the condition may not present at the time the dog is examined (which does not exclude the disease) and if the dog appears to be affected, only a genetic test will determine the specific type of PRA. Breeds with the X-linked recessive form of PRA will potentially produce affected puppies regardless of the breed and genetic status of the dog to which they are bred. This is because carrier females will have the potential to produce affected male puppies regardless of carrier status of the sire of the puppies because she can pass on the X chromosome with the mutation to males, who have only one X chromosome, and they will be affected. PRA is an excellent illustration of the potential varied genetic causes of the diseases that affect our dogs. Breed specific gene testing is available for many different genes in many breeds, with some gene mutations occurring in multiple breeds. Any cross breeding of dogs affected by the same mutation or affected with a dominant or X-linked condition will be at risk to produce affected puppies. This chance for detrimental genes to be passed on and to possibly negatively affect puppies is a risk in any breeding. Some hybrid breeders think that they need not be concerned about genetic risks based on the "hybrid vigor" and genetic diversity created with cross-breeding but genetic risks are present in any breeding. Each dog included in a breeding has unique genetic risks that always have the potential to be passed on to the next generation; appropriate health testing can help to ensure the healthiest puppies possible. A breeding program that is based on breeding healthy dogs that have received genetic testing for at-risk disorders based on their breed or their ancestry prior to breeding is important regardless of whether breeding purebred or breed-hybrid/crossbred dogs. Image attribution: Claudio Gennari... "Cogli l'attimo ferma il tempo"